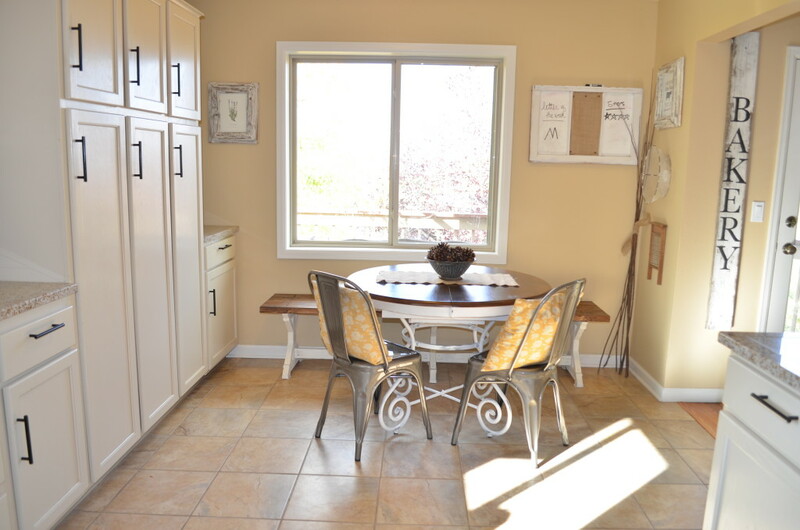 You know those spaces in your home that you just don’t like? No matter what, it doesn’t seem to fit. Something just seems off. Or just plain ugly in this case. That’s how I felt about our breakfast nook from the first day we moved in. I never liked it and it always bothered me. We’d been in the house about 3 months when I finally figured out the problem. 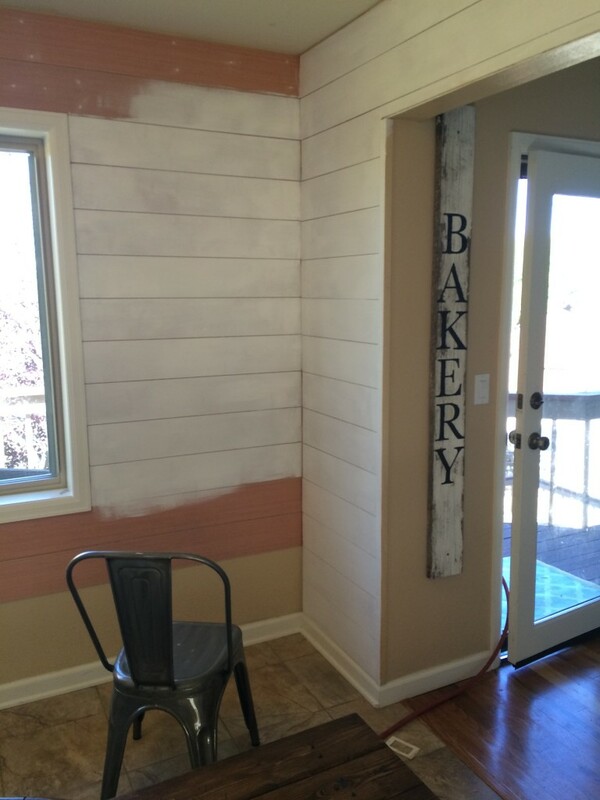 This space needed shiplap! 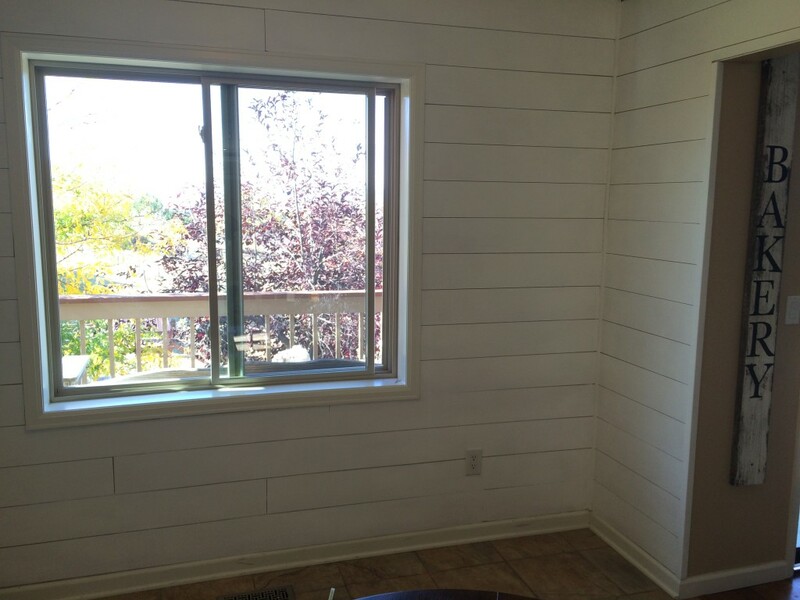 Yes, lovely shiplap. 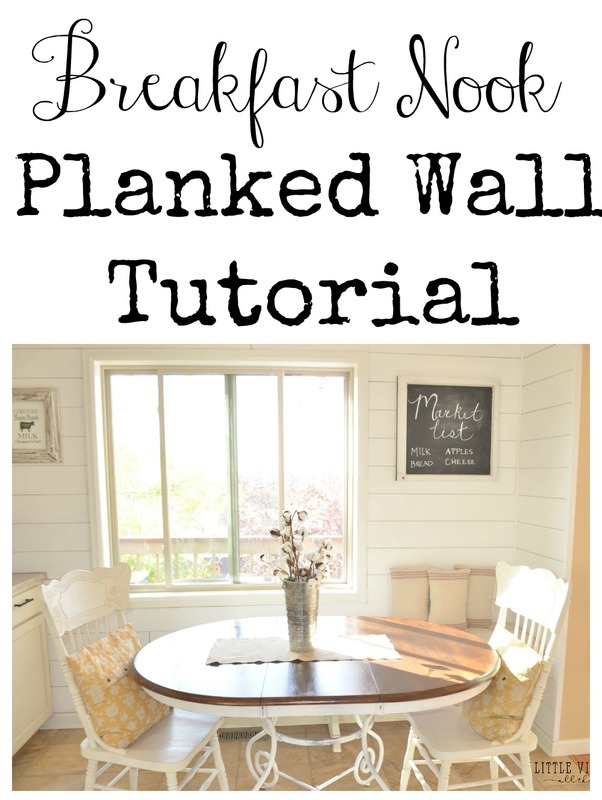 Or planked walls, if you do it the cheap way like I did. It was fairly simple to do and the results were definitely worth the work. And today I’m excited to share exactly how I did it–and yes, I did it myself. Actually, this was my first time using a saw. Ever. In my life. And I lived to tell about it. Some affiliate links are included in this post for your convenience. Not pretty. We all agree. I used 4×8 underlayment sheets from Lowe’s. If you ask nicely some jolly little fellow will come cut it into 6″ planks. I highly recommend doing this, it will make your life much easier. And it helps if you have an assistant. It went pretty fast working down and around the window. Make sure to use two nickels to separate your boards so all the planks are nice and evenly spaced. Some people use liquid nails to help secure the planks to the walls. But I’m lazy. 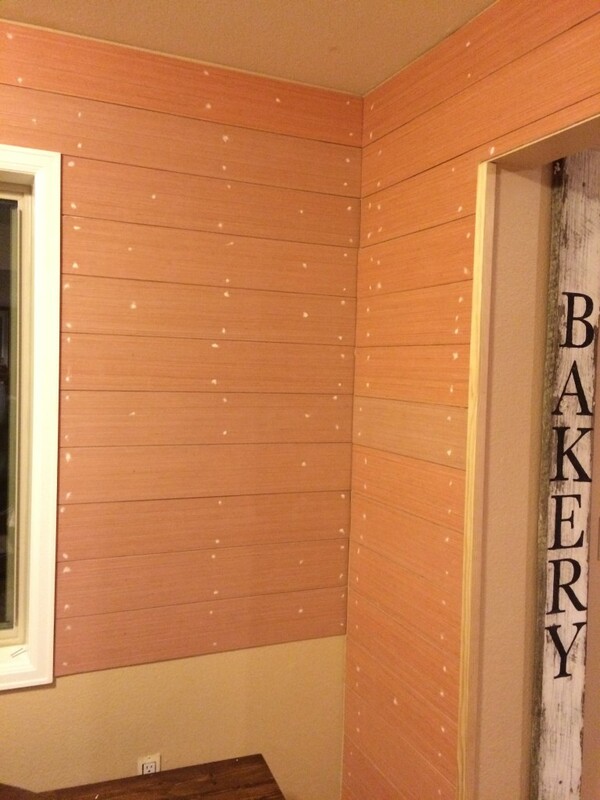 So instead I used a stud finder to find the studs in the walls, drew a line down the wall, and then used that to guide me as I nailed the planks on the wall. I used spackle to fill all the nails holes. Make sure you also sand them down after it dries! 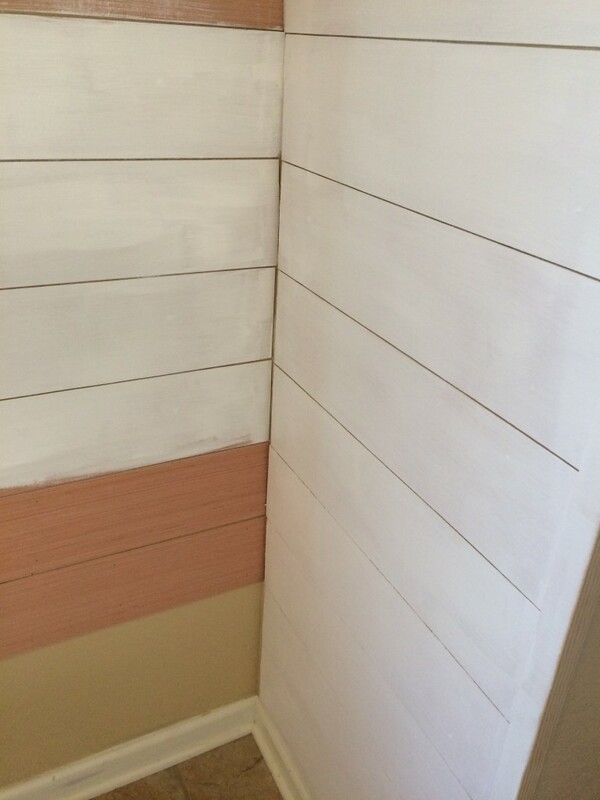 Also be sure to add some corner trim just to polish it off a bit and cover any uneven edges. This gives it a more finished look. 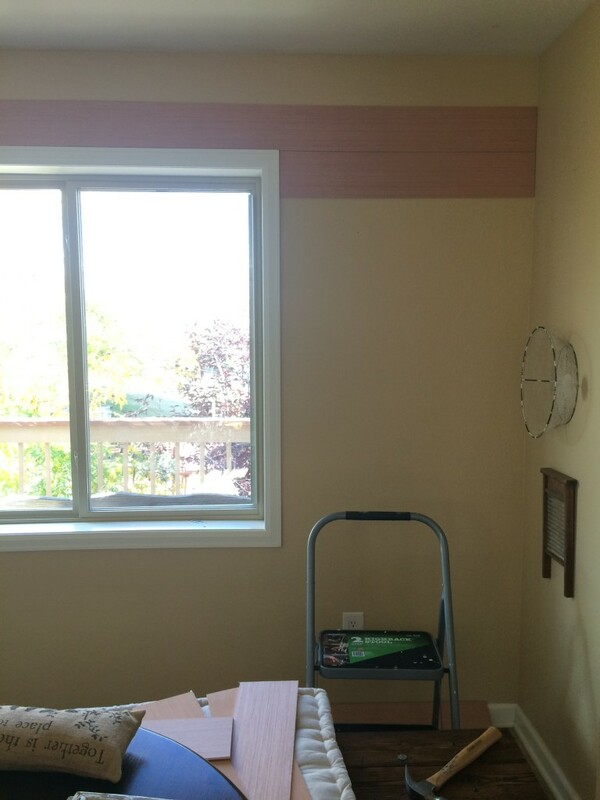 I primed the planks with Zinsser white primer. 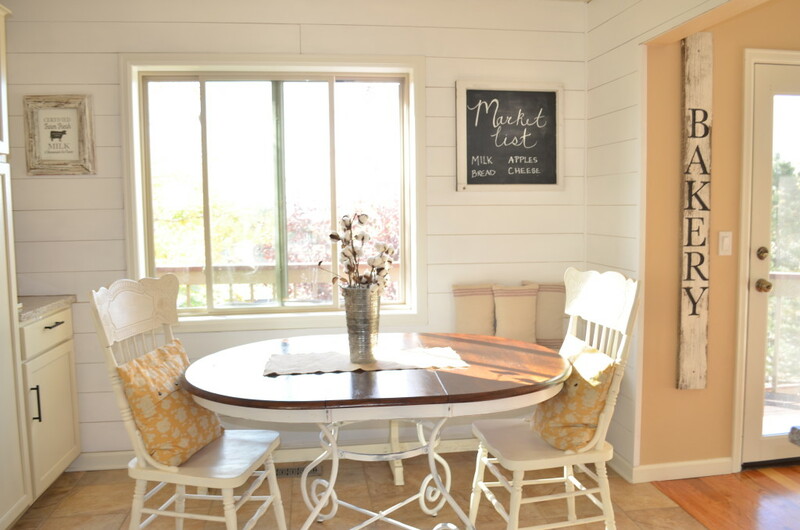 I love how it brightened up this space and added the perfect farmhouse charm! And honestly, I’m pretty shocked I was able to pull this one off by myself. And if I can do it, so can YOU. So go get yourself some planks and get to work. Let me know what you think in the comments below, I’d love to chat! That is amazing n I love the farm house look! Thanks for the insight, I think we can tackle this???? Love this. Just one question though- what are you putting between the pallets? Grout or paint? I’m confused on what to use to fill in the gaps between the boards. 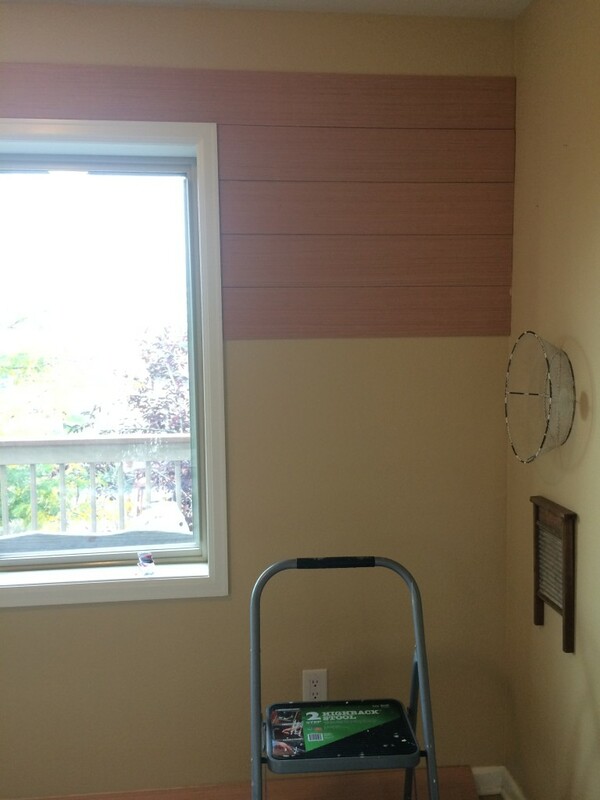 If you just painted the boards on the wall, how did you avoid getting it on the original wall. Does that make sense? Thanks for the help. 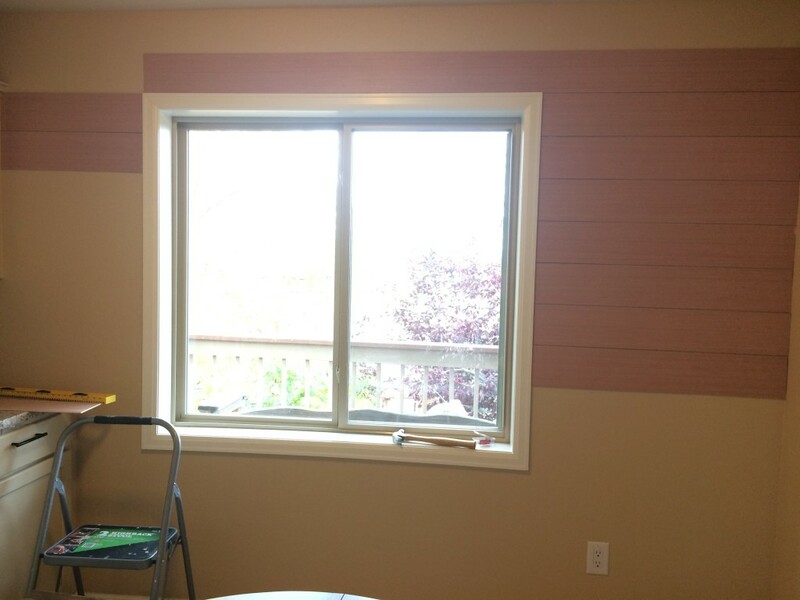 Hi Kelly, I first painted the wall a lighter color so you can’t see it through spaces between the boards, then you want to leave the gaps as they are. It’s fine to paint directly over them, the paint doesn’t really go in between and if it does it isn’t a big deal. Hope that helps! Awesome, I’m happy this will work for her. And thanks for sharing! Love this! Are the corners of your walls curved? I’ve been wanting to do this in our ours but we have curved corners and wasn’t sure how it would work. We don’t have curved corners, but I think it would still work. 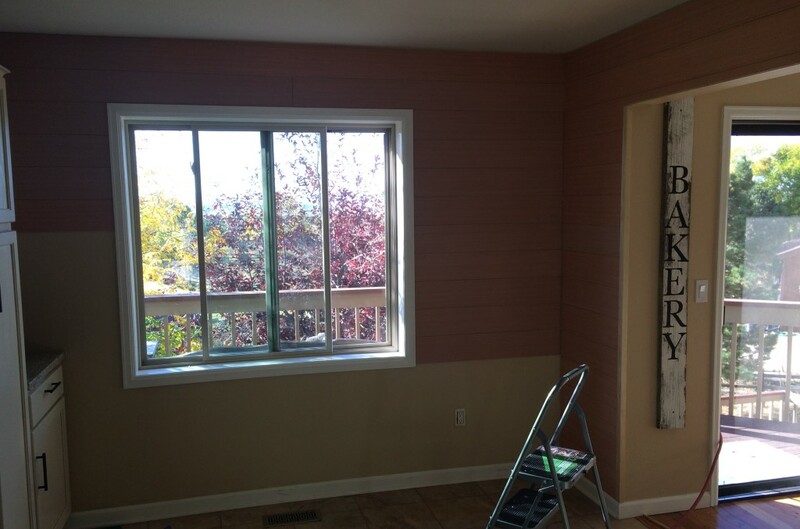 Maybe just don’t go all the way to the end of the wall with the plank and use a piece of quarter round trim to cap it off on the end right before the curve. Good luck! First of all can I just say how much I LOVE the look of your planked walls! Although now you’ve got me revved up to create something similar myself. The only problem is that I live in the UK, and don’t really understand what sort of product you are referring to when you say ‘underlayment’, is it plywood timber, mdf??? Thanks so much for the inspiration, and I’m DEFINITELY going to try this project. We own a manufactured home. I love it, but the walls are all a smooth shiney paneling with ugly pieces running down between the panels. 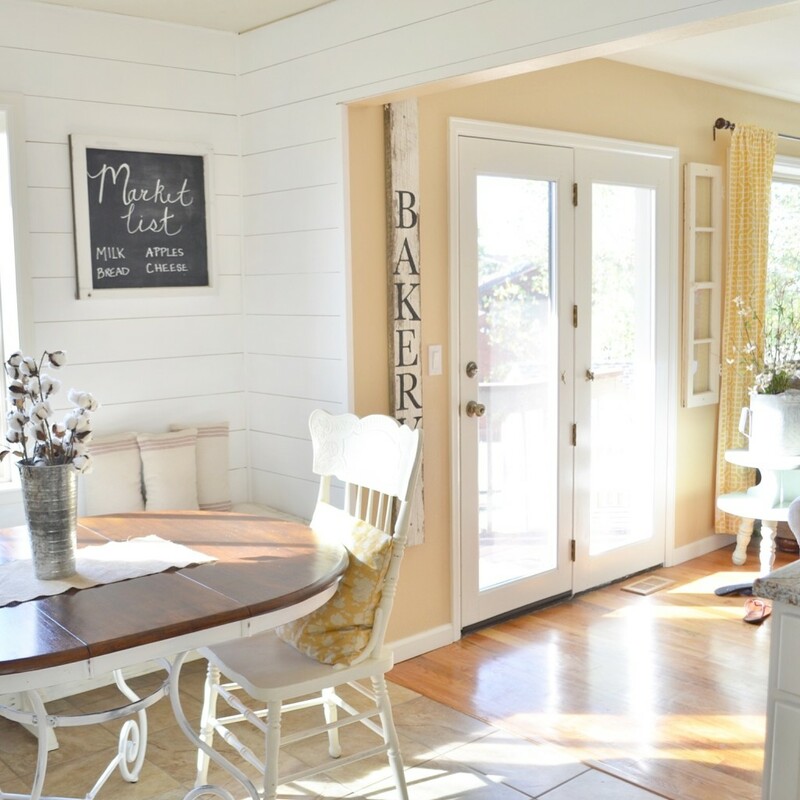 Your kitchen wall idea has given me some ideas as to what I can do to make the house look more country and not as “put together”. I absolutely ❤️ the planked walls! What a difference. I would really like to try this on a livingroom wall in my little farmhouse. Your ideas are amazing and I ❤️ Your decorating style! Thank you so much Annette! Give it a try, it’s actually very simple and goes quickly once you get the hang of it. And the difference it makes is well worth the effort! Is there a trick to painting the planks? How did you paint without paint filling in the nickel gap between the planks? Hi Ann! For the most part the paint didn’t go in between the planks, but when it did I just ran a toothpick in between and it wiped it out before it dried! Easy peasy. How many 4*8 sheets did you end up needing? Love the look, came out great! Hi Courtney! I think I needed 4 sheets for this wall. 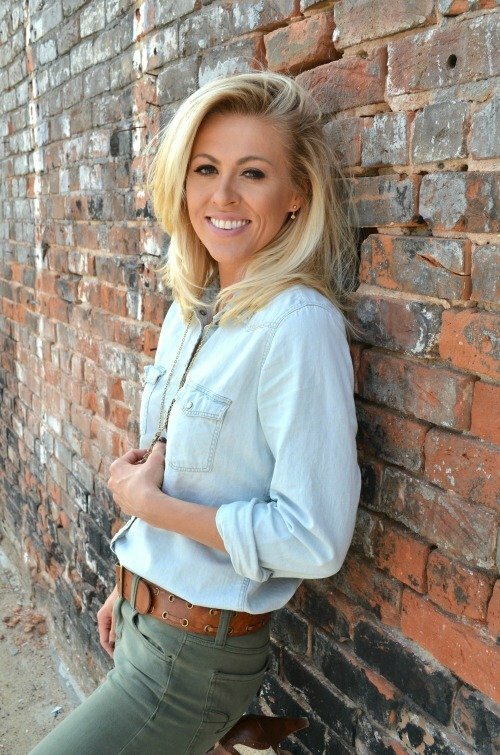 Just discovering this blog, and I LOVE your ‘voice’! You have a gift for teaching, and I love the way you write! 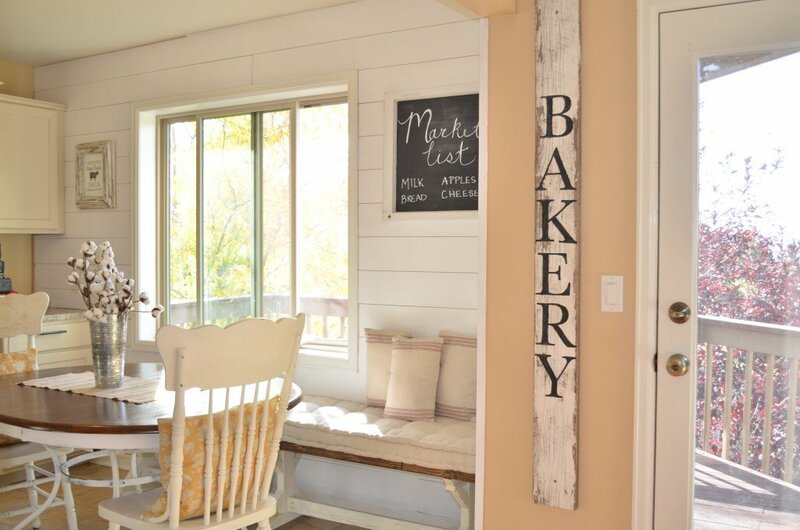 I sooo want to do this to a couple accent walls in our home…I just want to make sure about the ‘staying power’ of planked walls…I do staging consultation for realtors, and I am always weighing projects to our home against ‘trends’. We don’t plan to stay here longer than 8 years, tops, but I think if I don’t use the glue, it would be easier to fix up if it did seem too passé by then! Thanks for making this look easy!! Wow, thank you so much Lisa! I really appreciate that and I’m so happy to hear you are enjoying my blog. And I think you’d be ok to do this without glue, as long as you’re putting the nails in studs when putting the boards on the wall. It could easily come down any time! What is your 4×8 underlayment? These are not 1×6 boards? Is it like a sheet of thin paneling that you cut to 6″ “boards”? Did you sand the underlayment boards or just used them as is? I sanded the some of the edges a bit because they can get rough. But other than that I didn’t need to sand anything! I sanded down the edges that were a little rough, but that’s it! I think that could definitely work Beth! 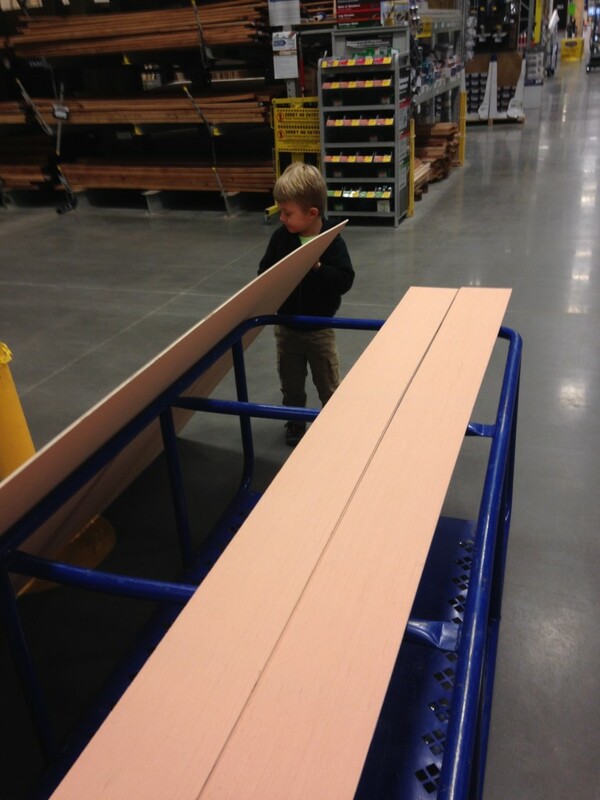 And I love your strategy to flirt with the Lowe’s employee to get the boards cut. Ha! I have to do that with my husband to get him to do some of my projects around the house. Sometimes a little sweet talkin’ is all it takes to get it done. 🙂 Good luck with your new home in Kentucky! Just wanted to say that your blog is like a breath of fresh air. You offer inspiration, and I enjoy every posts. I do have a question for you. 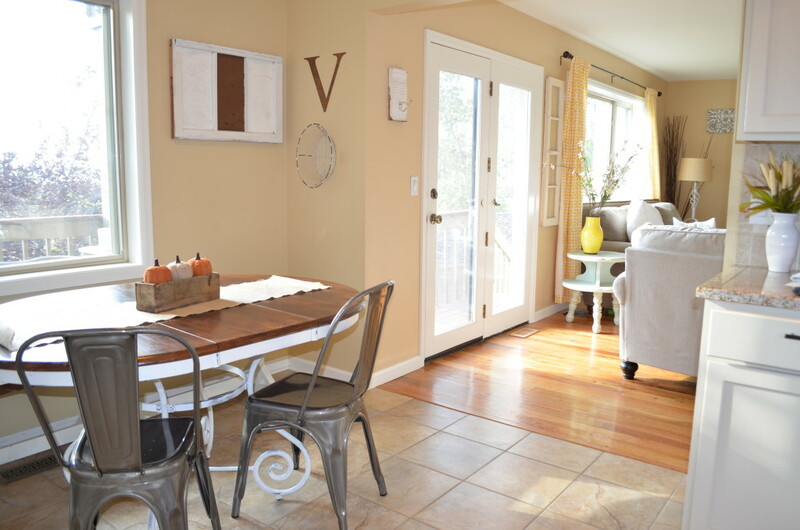 When styling your breakfast nook, do you try to balance each sid? 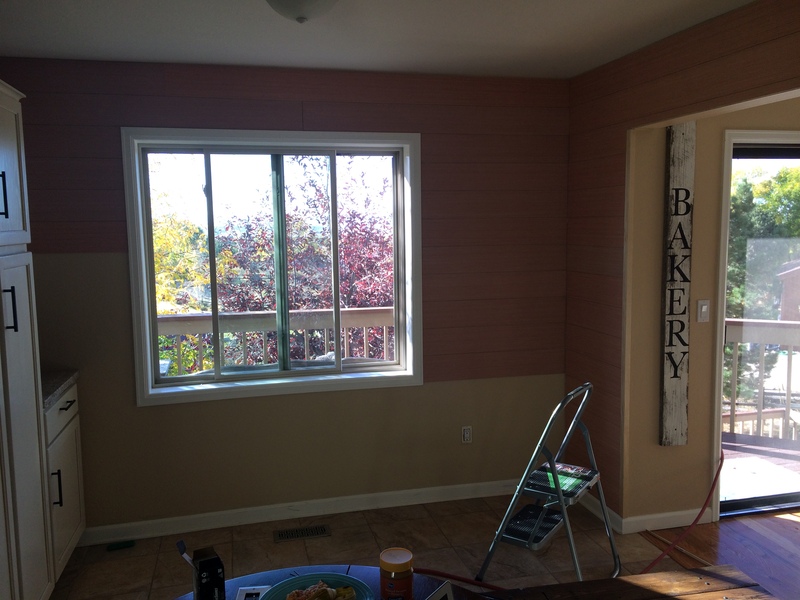 We recently planned a wall in our kitchen, and there is a window in the middle. I’m just not sure what to do! Sometimes I just want to leave it because it makes me smile! My hubby did a fabulous job! However, there are other times when I just want to style! Also, how do you hang things?!! Thanks! What kind of boards did u use..Original ship lap is tongue and groove but you put nickels in between? Where did you purchase the boards? I discussed that in the post–it’s underlayment, which works as an affordable alternative to real ship lap. I would love to do this in my living room around my French doors. 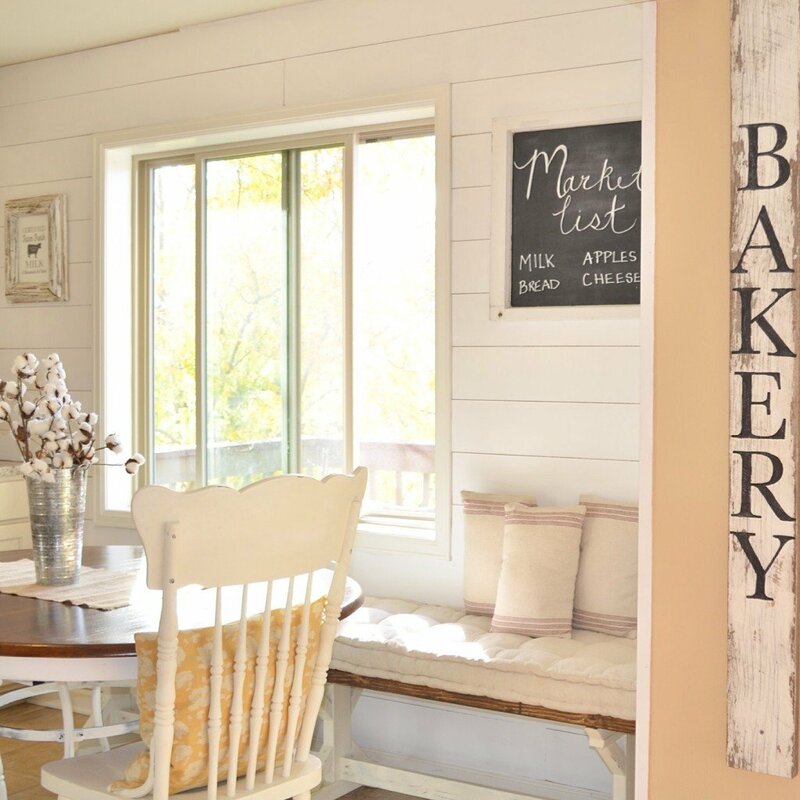 I’m going to make the Leap and redo my living room farmhouse style. Inspired by seven pet chickens whom I’ve come to love over the last six months. I’m looking up the underlayment boards now but it looks like they come in all different materials, do you know which one you used? There’s cork (which doesn’t sound right), particleboard, plywood and a bunch of others. Which one do you suggest?